From speaking to our existing clients we repeatedly hear of uncertainty and lack of clear information and guidance on how to identify, quantify and alleviate the risks with hazardous materials in the workplace. Without accurate information we understand it makes it difficult to prepare for the risks and to be aware of what hazards are currently in your workplace. With that in mind, we are here to enable you with the right information and tools to eliminate the risk. The following guidance document will make it clear what steps you need to take to create a safe and compliant laboratory. The use of hazardous and volatile materials is part of daily processes in the majority of labs in universities, research facilities and production plants worldwide. It is currently not feasible to avoid the use of hazardous materials and what is often neglected is unsafe storage of these materials. Improper storage of these materials creates a prominent risk to human life, the environment and the business itself. – Materials stored on structurally fragile shelves and above eye level. Planning and forecasting for the exact activities and work that will be carried out in the lab should be documented in advance of the activities beginning. E.g. Distillation, HPLC, GC. Identification of each material that will be used in each process is imperative before the work begins. Quantification of the amount of each material you will require: no more or less than required should be present in the lab at one time. 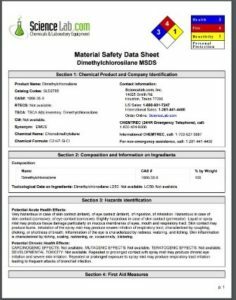 One of the most important checks you need to make is that you have access to the SDS (Safety Data) sheets for each material. The SDS sheets will provide critical information for any material used in your process and the hazards associated. It is a legal requirement under REACH regulations (EC) No. 1907/2006 that the manufacturer/supplier of the materials provide each SDS to you. For best practice you should consult the data sheets for each material before it is stocked in your laboratory. Once you have identified all of the above it will the enable you to begin assessing the risks that all operators in your lab will be exposed to and how to best mitigate those risks. Our team often find when meeting our clients on site that one common practice is forgotten in laboratories. There is often one designated area/cabinet or container for all hazardous materials to be stored internally. Flammables, Oxidisers, Toxic and Corrosive liquids to name a few will be stored together. Incompatible chemicals need to be segregated according to the hazard classes of each material. This is as important as with an adequate segregation scheme adverse reactions between incompatible chemicals such as oxidisers and flammables can be avoided. – Ensure you have adequate space in your facility to allow for safe segregation and storage of each class of material. 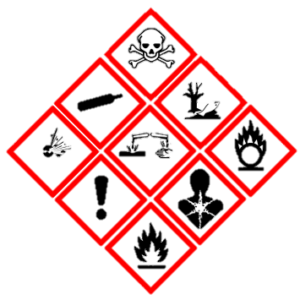 – Some materials will have more than one hazard associated. In this case you should always identify the address the most prominent risk first. e.g. Dimethlychlorosilane is both flammable and corrosive. In this case it would be best practice to address the flammable risk as a priority. There is no doubt that the biggest area for concern our team always highlight with clients is the lack of awareness when storing flammable liquids internally. When carrying out a risk assessment of your laboratory and the hazardous liquids you are using and storing, you should immediately identify the flammable materials. Once you have documented an accurate list, you should then quantify in litres how much flammable materials you absolutely need to store internally in your laboratory. It is now a legal requirement that flammables must be stored in safety storage cabinets that satisfy the requirements of EN 14470-1. We would also like to reiterate that where possible the quantities of flammables be kept to a minimum. Please watch the following video that will certainly portray how the negligent handling and storage of flammable liquids could have serious consequences. Risk is always present when handling and storing flammable liquids, so be the one to act and not react after it’s too late! If you neglect the above safety procedures when handling and storing hazardous materials in your lab that you are exposing your employees, the public and the environment to untenable risks. Insurance in many cases will become void if a fire or explosion occurs in your facility. The company and its owners will be liable for any damage to persons, property and the environment. Damage to your facility could cause long downtime and incalculable effects to the company’s reputation. In order to create the safest possible environment in your laboratory the final step you need to take is to create an emergency response plan in the event an accident occurs.This plan should be carefully written and shared with all employees. All tier 1 organisations are legally required produce an emergency response plan to the local authorities as part of COMAH Regulations 2015. Emergency response plans need to be prepared addressing all four areas above in detail including accident scenarios with the hazardous materials present in you laboratory. 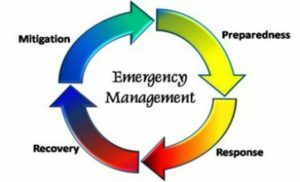 Once this emergency response plan has been drafted and approved by the certified body in your organisation, an open correspondence should be opened with the local emergency services and the Health & Safety authorities detailing this plan. From gathering extensive feedback from our valued client base and extensive research carried out throughout our 23 years in business, we are constantly striving to provide our clients with the tools and knowledge to eliminate the risks associated with hazardous material storage in industry. A key strength of Chemstore throughout its history has been anticipating and responding to the needs of our clients. Increasing the level of safety in your workplace is where our work begins. We will enable you to reduce risk, liability and downtime on your site. We will take your business beyond the legal requirements for health & safety and social responsibility in your organisation.